Although my blogsite postings have been few and far between recently I have been quite busy scribbling away in bits of paper and in my sketchbook when I have some spare moments. I've been trying to get back onto doing handdrawn work and, in particular, pen and ink illustrations. 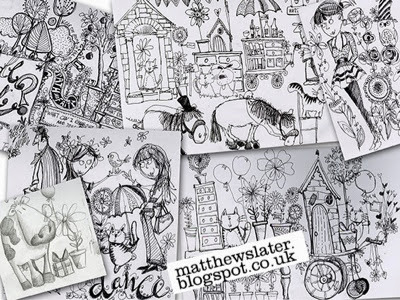 I love black and white line drawings and in many ways would rather work like this than in colour. I have always liked the fine art of detailed wood engravings and the cartoon/illustrative lines of people like Heath Robinson, Ronald Searle and Quentin Blake. There seems to be much more in the way of traditional line work around at the moment in much contemporary design rather than simple digital vector lines. Working on paper again is quite a liberating experience as there is no boundary of the screen edge or pages that have to be moved around and magnifications constantly being adjusted. I have been exploring quite a few ideas and trying to develop more of a personal brand and style that I can quickly and easily flow into with flexibility and creative freedom. This collection of scanned pages from my sketchbook is just my playing with ideas and seeing what will evolve and flow out of my trusty fountain pens. My aim is to translate these into proper pictures on white canvas or other media.